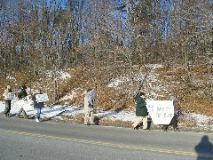 In the bitter cold, about a dozen people came out to protest the bulldozing of the Avila House site. 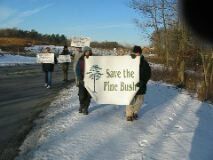 Though Save the Pine Bush had lost all of its appeals in the courts, we know that we are legally, morally and ethically right. 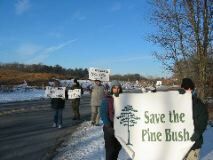 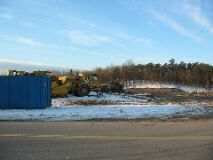 No more construction should be made in the Pine Bush. 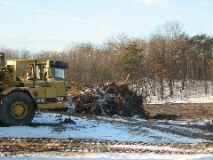 Temperatures hovered around 10 degrees, walking kept us warm. 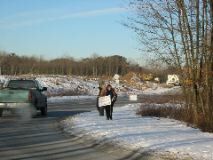 A passer-by brought us all coffee, for which we are deeply grateful. 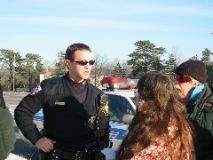 Lynne Jackson and John Wolcott have a friendly chat with an Albany Police Officer about safely protesting. 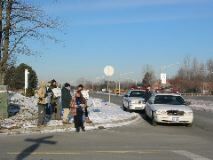 Two police cars were sent to talk to the protesters.